Even though days are slowly getting longer again, January still feels like the darkest, chilliest time of year. It’s hard not to want to stay inside, wrap yourself in a big fluffy blanket, and sip a mug of something warm. Candles are the perfect way to create a cozy hygge atmosphere in your home, so it’s a good thing our friends at Edens Garden have just released the most fabulous collection of essential oil candles. Edens Garden is giving 3 Hello Glow readers their choice of 1 essential oil candle from their website. Enter using the form below and look out for another giveaway on our Instagram account. Good luck! French Lavender for me, all the way. The Lemongrass Ylang Ylang Candle if I win. I like the Lavender Magnolia Candle. I would love the Cinnamon Sweet Orange Candle. Cinnamon Sweet Orange would be my choice. I want to receive Lavender Magnolia. I’d love to try the Lavender Magnolia candle. The Tangerine Jasmine sounds delightful. Thanks for the sweet sweepstakes! I think I would pick Cinnamon Sweet Orange. I love cinnamon candles. I would want the TANGERINE JASMINE CANDLE. I love citrus scents so I think I would love the smell of the Cinnamon Sweet Orange candle. I would love to have the Cinnamon Sweet Orange Candle. Lavender Magnolia or Lemongrass Ylang Ylang — both sound amazing. If I won I would love the have the Lemongrass Ylang Ylang Candle. I am a fool for lavender so french lavender sage would be my choice :-) thanks for this opportunity! I would love the tangerine jasmine candle. Jasmine is one of my favorite scents and I am sure the addition of tangerine gives it a refreshing twist. I would like the tangerine candle!! Tangerines Jasmine sounds uplifting & cheerful! Cinnamon Sweet Orange sounds amazing to me! I would choose the Lemongrass Ylang Ylang Candle scent. It sounds divine. I would choose the Lavender Magnolia. I’d pick French lavender sage or tangerine jasmine! I want the cinnamon sweet orange scent! Oh my, I think I’d really like their “Cinnamon Sweet Orange Candle” scent. Thanks and God bless! I would like cinnamon and sweet orange. I would like to try the Cinnamon Sweet Orange Candle. I think it would be French Lavender Sage. Tangerine Jasmine is my candle of choice! I would love the lavender magnolia scent. Flower scents are my favorite. Cinnamon Sweet Orange would be my pick. I would like the cinnamon sweet orange candle. I think that the Lavender Magnolia Candle is my favorite. I would choose The Lavender Magnolia candle! I would like the Lavendar Magnolia scent. Cinnamon Sweet Orange sounds really nice. French Lavender Sage sounds like SUCH a yummy candle scent! I love candles so much, they make a house feel and smell so liveabl;e and nice! I really like the Tangerine Jasmine scented candle. I would love the Lavender Magnolia Candle. I just love lavender and its calming properties. I would choose the Tobacco Patchouli candle. Thanks for the chance! If I won, I would love to receive the French Lavender Sage Candle. The tobacco patchouli candle looks like a solid underdog. I’ve never used an essential oil candle before, but that’s definitely the one I’d go for. I’d love the Tobacco Patchouli scent. Thank you for the giveaway. I’d choose the Cinnamon sweet orange. The Lavender Magnolia sounds really relaxing! Lemongrass Ylang Ylang Candle sounds amazing. I would love the Lavender Magnolia scent! I’d select the Eden’s Garden Lavender Magnolia candle. I would like to try cinnamon sweet orange. I would like Cinnamon Sweet Orange. I think I’d like Tangerine Jasmine if I were to win. It was hard to pick. I love all citrus scents. I would pick the Tangerine Jasmine Candle. Cinnamon Sweet Orange sounds amazing. I would choose the Cinnamon Sweet Orange Candle. If I win I’d like to receive the tangerine jasmine candle. i would want the lavendar magnolia! sounds amazing! I would choose the Tobacco Patchouli Candle if I won. I like the Tangerine Jasmine Candle. I would choose a French Lavender Sage Candle. Cinnamon Sweet Orange seems like a great scent. I’d like the Cinnamon Sweet Orange Candle if I won. I would like to win lemongrass. I would choose the French Lavender Sage Candle. The Cinnamon Sweet Orange would be my jam! I would pick the Cinnamon Sweet Orange scent. I like the French Lavender Sage Candle. I would like the Lavender Magnolia Candle. I’d want to receive the French Lavender Sage Candle. the Tangerine Jasmine Candle sounds yummy, I love citrus smells. 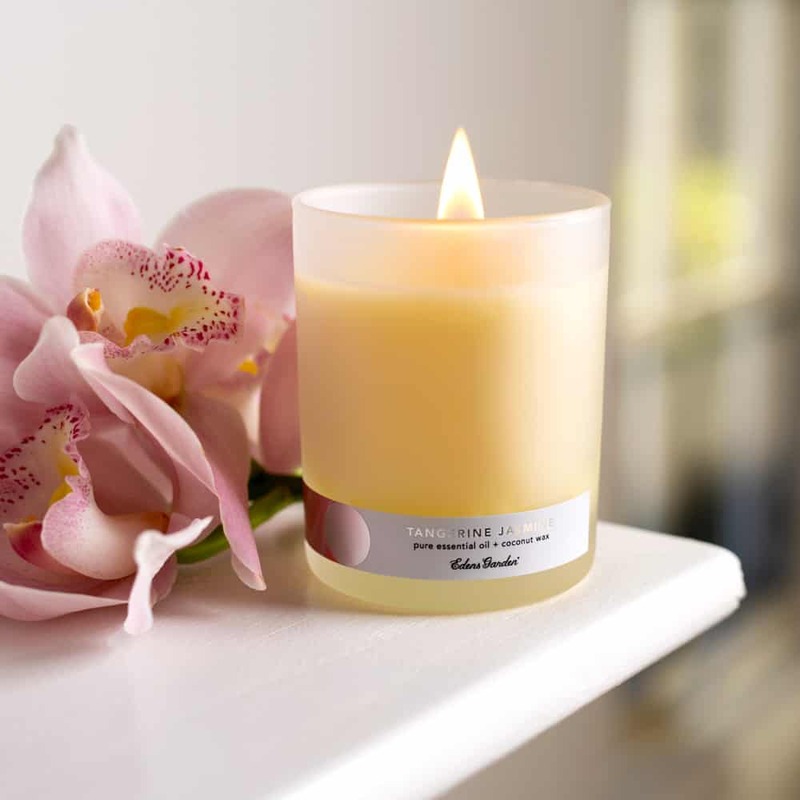 I would choose the Lemongrass Ylang Ylang Candle, I just love the scent of lemongrass! I would love the Lavender Magnolia! This combines my favorite scent with my husbands favorite scent. Lavender Magnolia, please and thank you! Cinnamon Sweet Orange sounds divine! I’d love the lemongrass one! I would pick either the Tangerine Jasmine or Tobacco Patchouli . The Cinnamon Sweet Orange scent sounds awesome! I would want the Lavender Magnolia candle. Cinnamon sweet orange sounds amazing! I would love to try the Tangerine Jasmine Candle if I won. So many wonderful smells I would love to try from them! All the scents look great but I would pick Tobacco Patchouli! I’d like to receive the Cinnamon Sweet Orange candle. I always favor the lavender scent, so I would probably pick Lavender Magnolia. The tangerine jasmine sounds really good. Edens Garden Cinnamon Sweet Orange essential oil candle. The Lavender Magnolia scent sounds amazing! The French Lavender Sage seems the most appealing to me, although, they are all fresh sounding. I’d pick the Cinnamon Sweet Orange scent. Reminds me of my favorite tea. I would choose the Lemongrass Ylang Ylang Candle. Cinnamon Sweet Orange is the candle I would want if I won. I would choose Tangerine Jasmine as my first choice. I would like to get Edens Garden Cinnamon Sweet Orange essential oil candle. I’d love to try the Tangerine Jasmine scent. I’d like to try the Tangerine Jasmine Candle. This is such an amazing product! I love living clean and healthy. This is perfect! I would like the lavender magnolia scent if I win.